CAMARILLO, Calif., May 31, 2017 – Semtech Corporation (Nasdaq: SMTC), a leading supplier of analog and mixed-signal semiconductors, announced it will be participating as a sponsor at the 8th LoRa Alliance™ All Members Meeting (AMM) from June 12-14 at the Franklin Institute in Philadelphia. 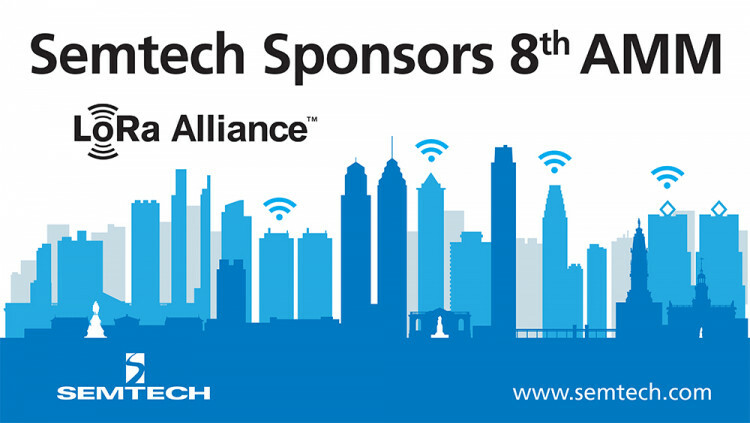 Semtech, a founding member of the LoRa Alliance, is sponsoring a networking reception for LoRa Alliance members, and Mohan Maheswaran, President and Chief Executive Officer at Semtech, will be addressing members, global carriers, suppliers, and partners throughout the event. Comcast, the newest LoRa Alliance corporate member, is headquartered in Philadelphia and will serve as host-sponsor of the 8th AMM. Comcast’s machineQ service is currently using Semtech’s globally-proven LoRa® wireless radio frequency technology in trial deployments in the machineQ IoT network in Philadelphia, Chicago and San Francisco. Semtech, Comcast and other LoRa Alliance members are collaborating to drive the global success of making LoRaWAN™ the de facto IoT standard, for global, carrier-grade low-power wide area networks (LPWANs) that provides long-range, low-power connectivity between sensors and wireless network base stations. LoRaWAN is an open standard protocol which enables IoT innovation through multiple factors including a sensor certification program, certified secure interoperability, a variety of open business models, and a strong global ecosystem. The 8th AMM will feature a full 3-day program for members, as well as an Open House that will be open to the public on Wednesday, June 14. These activities include LoRaWAN 101 hands-on training, informational use-case sessions, a Marketplace exhibition, and the machineQ Smart City Summit, where Philadelphia City leaders and technologists will come together with LoRa Alliance members to explore how LoRaWAN technology can contribute to Smart City initiatives. Additional activities include a Comcast-organized Smart City Hackathon and a gathering of more than 25 global carriers. Semtech’s LoRa wireless RF technology is a widely adopted low-power, long-range solution for IoT that gives telecom companies, IoT application makers and system integrators the feature set necessary to deploy low-cost, interoperable IoT networks, gateways, sensors, module products, and IoT services worldwide. IoT networks based on the LoRaWAN™ specification have been deployed in over 50 countries. To learn more about how LoRa enables IoT, visit Semtech's LoRa/IoT site and join the LoRa Community to access free training as well as an online industry catalog showcasing next-generation products. All statements contained herein that are not statements of historical fact, including statements that use the words “will,” “committed to,” “designed to,” or other similar words or expressions, that describe Semtech Corporation’s or its management’s future plans, objectives or goals are “forward-looking statements” and are made pursuant to the Safe-Harbor provisions of the Private Securities Litigation Reform Act of 1995, as amended. Such forward-looking statements involve known and unknown risks, uncertainties and other factors that could cause the actual results of Semtech Corporation to be materially different from the historical results and/or from any future results or outcomes expressed or implied by such forward-looking statements. Such factors are further addressed in Semtech Corporation’s annual and quarterly reports, and in other documents or reports, filed with the Securities and Exchange Commission (www.sec.gov) including, without limitation, information under the captions “Management’s Discussion and Analysis of Financial Condition and Results of Operations” and “Risk Factors.” Semtech Corporation assumes no obligation to update any forward-looking statements in order to reflect events or circumstances that may arise after the date of this release, except as required by law. Semtech, the Semtech logo, and LoRa are registered trademarks or service marks, and LoRaWAN is a trademark or service mark, of Semtech Corporation or its affiliates.